Although the majority of visitors to Hong Kong actually arrive in Lantau, at the Chep Lap Kok International Airport, it is common to leave the island immediately for a hotel elsewhere in Hong Kong. Returning to Lantau only later for sightseeing or dining. In that case the routes to and from the island are important, but luckily there are many good options as Lantau is well integrated with the Hong Kong wide transport system. By far the best way to get to Mui Wo, which is on Silvermine Bay and sometimes refered to by that name, is to take a ferry from the Central district of Hong Kong. 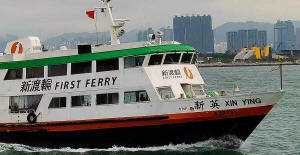 The Central Ferry Piers are a major transpiration hub and easily accessed from anywhere in Hong Kong. Either take a taxi to Central Pier #6, or alternatively take the MTR to either Hong Kong or Central Stations, they are interconnected, and follow the numerous signs to the ferry piers. When you arrive at the Piers you will find that they are simply numbered from 1 to 10, so heading to #6 is easy and when at the pier you can take the next available ferry. The ferries come in two varieties, either "slow" or ordinary that take about one hour to make the trip, or "fast" which is half the time and double the price. If you have the time the slow ferry is more relaxing and allow you to go out on the open deck and enjoy the sights of Hong Kong's busy harbour, while by comparison the fast ferry has only enclosed air-conditioned seating. If visiting any of these attractions then the train is by far the best way to get there. From Hong Kong Island take a train to Hong Kong Station by following the Island Line to Central, then walking to the interconnected Hong Kong Station. There trains run on the high speed Tung Chung line all the way to the terminus at Tung Chung. As there are few stops on this line the journey is fast indeed and within 20 minutes you will find yourself alighting at the modern shopping complex of Tung Chung. Leave the MTR station via Exit B and follow the signs for a 2 minute walk to the Ngong Ping 360 Cable Car, this will take you directly to the sumit next to the Big Buddha. The cable car ride of course gives great views over the island, and takes about 20 or 30 minutes. Alternatively from the same MTR Exit B walk to the town center and find New Lantao Bus 23 which also goes to the Buddha, but takes almost double the time at around 45 minutes. If going to Mui Wo then the best way from Tsim Sha Tsui is to cross Victoria Harbour using the Star Ferry which will dock in Central at Pier #7. Then just walk 1 minute to the next pier which is Pier #6 and from there take a ferry to Mui Wo. Details of the ferries can be found at the New World First Ferry Web Site listed above. Alternatively if going to Po Lin then from Tsim Sha Tsui take the MTR towards Tuen Wan, but change trains at Lai King to the oposit platform where you can catch the Tung Chung Line towards Tung Chung, and then follow instructions as above. From other places in Kowloon it depends on where you are going on Lantaun and where in Kowloon you are. In the southern part of Kowloon then follow instructions above as for Tsim Sha Tsui, however if in the northern or eastern parts of TST it is best to take a taxi at least as far as Kowloon MTR station. Take care to go to Kowloon MTR Station and not Kowloon East MTR station. From Kowloon MTR station the Tung Chung line will take you onto Lantau and there let you use either the Ngong Ping cable car, or the bus #23, to get to the Po Lin Monastery.